Shirts With Random Triangles: Clemson DE Shaq Lawson To Forego Senior Season, Declares For The 2016 NFL Draft. Clemson DE Shaq Lawson To Forego Senior Season, Declares For The 2016 NFL Draft. Shaq Lawson. Image via greenvilleonline.com. 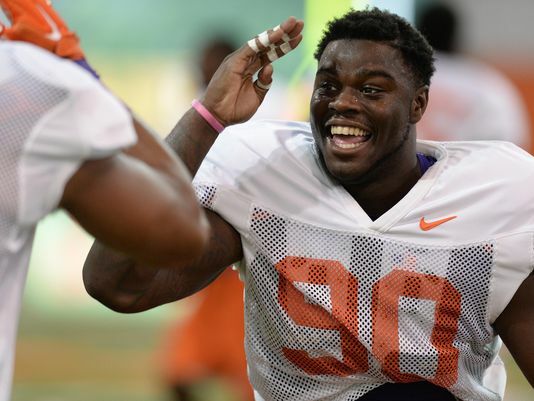 It looks as though Shaq Lawson's days as a Clemson Tiger are numbered. The Clemson defensive end announced on Tuesday that he plans to forego his final year of eligibility and enter the 2016 NFL Draft. Lawson, who leads the nation in tackles for loss, says that he discussed the move with his family and with the support staff at Clemson before making the decision. “I had planned on what I wanted to do,” Lawson told Houston television station FOX 26 . “That was my goal throughout the season, is to possibly get drafted. I worked hard for (this). I feel like it paid off. Lawson, is in Houston for the 2015 Lombardi Award presentation ceremony. He is among four finalists for the award, presented to the nation's top college linebacker. Ohio State DE Joey Bosa, Texas A&M DE Myles Garrett, and Penn State DE Carl Nassib are the other three finalists.